The global UPS market is expected to display steadfast growth between 2017 and 2025, gaining traction from the increasing frequency of power fluctuations and growth in the number of data centers globally. Power fluctuations that pose a threat to human life such as in hospitals and factories or can cause damage to property need to be equipped with reliable power back up to prevent such accidents. Apart from this, the incessant penetration of smartphones leading to the generation of massive volumes of data has led to the creation of mega capacity data centers. Data centers require continuous power supply to prevent loss of operational data in the event of an outage and to keep cooling systems running. However, on the flip side, the high cost of installation and maintenance of UPS is slowing the growth of global UPS market. Transparency Market Research projects the global UPS market to rise at a CAGR of 7.5% between 2017 and 2025. Progressing at this pace, the market which stood at US$5,201.9 mn in 2016 will become worth US$9,881.9 mn by 2025-end. The report studies the global UPS market on the basis of application, kVA range, and geography. By application, the market could be classified into six key segments, viz. data center & facility UPS, industrial UPS, marine UPS, network, server & storage UPS, PC, workstation & home UPS, and others. Of them, in 2016, data center & facility UPS segment was registered to generate the leading revenue in the market. Going forward, the segment is expected to register a significant 7.5% CAGR during the forecast period 2017-2025. By kVA range, the report segregates the global UPS market into the segments of less than 5 kVA, 20.1-60 kVA, 5.1-20 kVA, 60.1- 200 kVA, and more than 200 kVA. In 2016, 20.1-60 kVA stood as the leading revenue generating segment on the back of its high adoption in data centers. However, the segment of less than 5 kVA is projected to rise at a significant CAGR over the 2017-2025 forecast period. The less than 5 kVA segment is expected to find extensive application in smart home technologies especially in developed countries in Europe. In terms of geography, the report divides the global UPS market into North America, Europe, Asia Pacific, South America, and the Middle East and Africa. Europe followed by North America were registered as the leading revenue generating regions in 2016, and are expected to maintain those positions over the 2017-2025 forecast period. The TMR report projects Asia Pacific to display the leading CAGR from 2017 to 2025 on the back of significant economic development in the region. The development of mega capacity data centers and expansion of cloud storage utilization capacity are key factors for the growth of this region. Emerging economies such as India and China have become preferred destinations for data center needs of large mobile carriers. This is mainly because of advantages of low real estate cost and low labor cost in these countries. In the Middle East and Africa, GCC countries including Saudi Arabia and UAE are expected to emerge as significant markets for UPS. 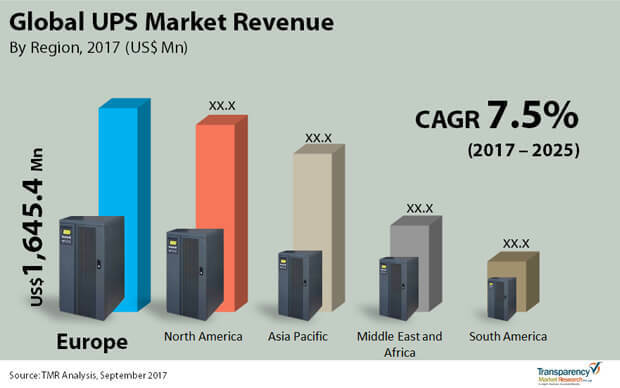 Key participants in the global UPS market include Eaton Corporation Plc., Uninterruptible Power Supplies Ltd., Riello Electtronica, Schneider Electric SE, The Emerson Electric Company, Vertiv Co., General Electric, Legrand, ABB Ltd., and Mitsubishi Electric Corporation. The report provides analysis of the UPS Market for the period 2015–2025, wherein the years from 2017 to 2025 is the forecast period and 2016 is considered as the base year. Data for 2015 has been included as historical information. The report covers all the major trends and technologies playing a major role in the UPS Market growth over the forecast period. It highlights the drivers, restraints and opportunities expected to influence the market growth during this period. The study provides a holistic perspective on the market’s growth in terms of revenue (in US$ Mn) across different geographical regions, namely North America, Europe, Asia Pacific, Middle East & Africa and South America. Report highlights the key trends affecting the market on a global scale. Furthermore, region wise prominent countries/regions covered in the report includes - The U.S, Canada, Germany, France, the U.K., India, China, Japan, GCC, South Africa and Brazil. The market overview section of the report showcases the market dynamics and trends which includes drivers, restraints, opportunities that influence the current nature and future status of this market. It also provides an overview about the key market indicators given across the five geographical regions. Under the key trends, various trends adopted by players are described. Under the porter’s five forces analysis section, a brief analysis of the level of competition within the UPS industry is given and business strategy is provided in order to determine the competitive attractiveness and intensity of the UPS Market. The report also includes key industry developments covering significant advances made by leading market players over the period of time. The report provides competitive landscape of the UPS Market, thereby listing out all the major players according to their geographic presence, market attractiveness and recent key developments. The competitive landscape section of the report gives an overview about the market share of several key players for the year 2016. The UPS Market data estimates are the result of our in-depth secondary research, primary interviews and in-house expert panel reviews. These market estimates have been analyzed by taking into account the impact of different political, social, economic, technological, and legal factors along with the current market dynamics affecting the market growth. Factors including market position, offerings and R&D focus are attributed to company’s capabilities. This section also identifies and includes various recent developments carried out by the leading players. Moreover, key takeaways section provided at the end of competitive landscape section would help the operating companies to make the best move in the market. Eaton Corporation Plc, Schneider Electric SE (APC), Emerson Electric, Legrand, Uninterruptible Power Supplies Ltd., Vertiv Co., Mitsubishi Electric Corporation, ABB Ltd, Riello Elettronica are few of the key players which have been profiled in this study. Details such as financials, business strategies, SWOT analysis, and other such strategic information pertaining to these players has been duly provided as part of company profiling.